Mystic, Conn. (May 18, 2016) — Mystic Seaport announces the yacht America will be visiting the Museum June 11-15. America is a reproduction of the schooner that won the Royal Yacht Squadron’s “100 Guinea Cup” race around the Isle of Wight in 1851. Renamed the America’s Cup, the trophy was successfully defended by the United States against all challengers until 1983 and remains the longest winning streak in sporting history. America owner and captain Troy Sears is taking the vessel on an extensive tour of the East and Gulf coasts and the Caribbean to raise awareness of the 2017 America’s Cup defense in Bermuda. The yacht is scheduled to arrive at Mystic Seaport sometime during the day on Saturday, June 11. She will be available for Museum visitors to board during the mornings of June 12-15. 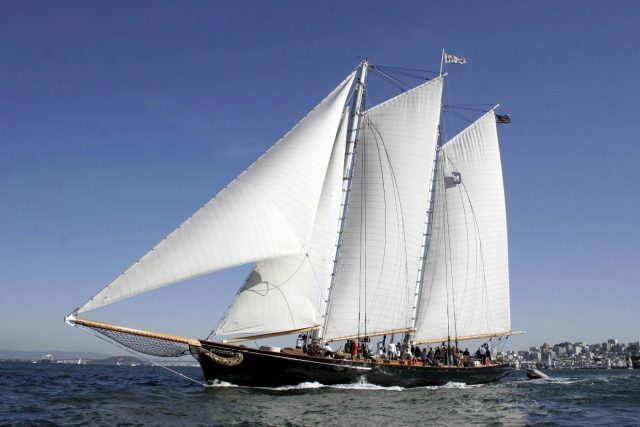 In addition, she will offer day sails down the Mystic River to Fishers Island Sound during the afternoons of June 11-14. Also visiting the Museum during the same period will be the Bermuda sloop Spirit of Bermuda, a 112-foot replica of a three-masted Royal Navy sloop-of-war from the 18th century. She also will be open for visitors to board the mornings of June 12-14. “The History and Evolution of the America’s Cup.” Captain Troy Sears and Mystic Seaport photography curator Mary Anne Stets will discuss the America’s Cup, its past, present, and future. Included in this talk will be still and moving images from the Museum’s vast collection of America’s Cup artifacts. Monday, June 13, at 7 p.m.
“Up Close with Spirit of Bermuda.” Bermuda Sloop Foundation directors Malcolm Kirkland, Jay Kempe, and Alan Burland will talk about the background of the Foundation and how and why Spirit of Bermudawas built. Also joining the conversation will be Bermuda’s captain Stuart Birnie, who will speak about youth development using traditional vessels such as Spirit of Bermuda, with reference to vessels he has experience with in the Pacific, including Polynesian voyaging canoes like Hokule’a, scheduled to visit Mystic Seaport during the WoodenBoat Show, June 24-26. Tuesday, June 14, at 7 p.m.
“The America’s Cup with Tucker Thompson.” The official TV and public host of the 35th America’s Cup, Tucker Thompson, will deliver an engaging multi-media presentation about the event. Highlights include the Cup’s storied history, the secrets behind Oracle Team USA’s dramatic comeback in AC34 in 2013, and a behind-the-scenes view of the upcoming 35th America’s Cup in Bermuda. Monday, July 11, at 7 p.m.
Tickets for each event are $15 for Museum members and $20 for non-members. A series ticket for all three events is available for $40 for members and $55 for non-members. All three talks will be held in the River Room at Latitude 41° Restaurant & Tavern. The day sails on America will depart from and return to Mystic Seaport. Boarding will begin at 1 p.m. and the sails are expected to last 2 ½ hours. Tickets are $85 per adult and $45 for children under the age of 12. Museum admission is not required. Tickets for the day sails and all of the events can be purchased by calling 860.572.5339. After their stay at Mystic Seaport, America and Spirit of Bermuda will depart for Newport, RI, to participate in the 2016 Newport-Bermuda Race. Mystic Seaport is the nation’s leading maritime museum. Founded in 1929, the Museum is home to four National Historic Landmark vessels, including the Charles W. Morgan, America’s oldest commercial ship and the last wooden whaleship in the world. The Museum’s collection of more than two million artifacts includes more than 500 historic vessels and one of the largest collections of maritime photography in the country. The state-of-the-art Collections Research Center at Mystic Seaport provides scholars and researchers from around the world access to the Museum’s renowned archives. Mystic Seaport is located one mile south of Exit 90 off I-95 in Mystic, CT. Admission is $26 for adults and $17 for children ages 6-17. Museum members and children 5 and under are admitted free. For more information, please visit www.mysticseaport.org and follow Mystic Seaport on Facebook, Twitter, and YouTube. Posted in Press Releases on May 18, 2016.